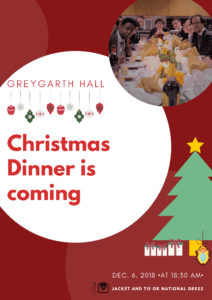 Christmas Dinner: The residents’ Formal Christmas Dinner will take place on Thursday 6th December. Starting with an aperitif at 18.30 in the lounge. Jacket and tie or formal national dress required.